I'm excited for this review. I've been excited ever since I went to one of my local beer/cider suppliers to pick out my next brew. I like hard cider. I like spiced chai tea. This cider is billed as having both. Therefore, thanks to the transitive property of equality, I should like it (that's how that works, right?). 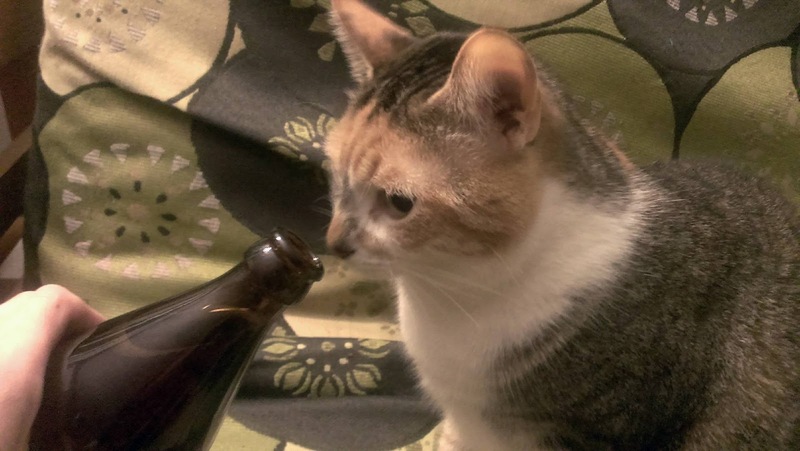 Now, before I get into the post proper, please let me take a moment to say that I did not go into the last few brews I've discussed blindly--I'd had them before. I had not run through them with the fine-tooth comb that is the John Likes Beer treatment. But, more or less, I knew what I was getting. The Dude's Rug, I am pleased to announce, is a completely new experience for me. What you're about to read is my 100% first impression (look forward to similar firsts with the next handful of posts I have lined up). B. Nektar was found founded in 2006 and is, indeed, a meadery (as you probably could have guessed from their name, which should now make sense to you). They've been brewing commercially since 2008 and have the prestige of being the very first meadery to crack into RateBeer's Top 100 Breweries list. All in all, B. Nektar's Our Story page presents a pretty illustrious pedigree that makes me even more excited to uncap the bottle of cider before me (plus, the meadery is located in Ferndale, MI, a city mentioned in a Mind Fish song, which gets coolness bonus points). 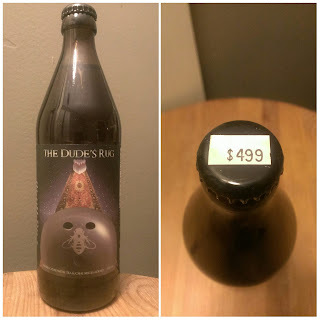 Although it doesn't list the (incredibly obvious) Big Lebowski reference, the official Dude's Rug page is nice and informative. It contains the ingredients (being cider and all the spices associated with chai tea), notes on the aroma (apples, chai, and raisins), and a write up of the overall experience (apples and chai, black tea, and a red apple skin aftertaste). But wait--there's more! It tells that the cider has a 5.5% ABV and talks about its appearance (which, for the purposes of this blog, does not matter in the slightest). The meadery is spot-on with the description of the cider's aroma. It's all apples and chai, mingling in utter harmony. Its enticing and damn near intoxicating in and of itself, unless you're Purrl. Then you give the bottle a quick two whiffs before ignoring it completely. Maybe she has a cold (she has been a touch wheezy lately), or maybe this cider just isn't her cup of tea. Ha! Get it? Because of the chai? B. Nektar also describes the cider's flavor with acute accuracy. I get the cider and chai. I get the black tea lurking around in the back. And, oddest of all (to me, at least), I get the sensation of the first bite into a red delicious apple in the aftertaste. Seriously. This cider's something else. The mouthfeel surprised me. I expected The Dude's Rug to be smooth. Instead in got a chewy cider (bubbly, not pulpy). It's not bad--it's actually the opposite, in fact--just unexpected. Which, in a cider where I had the entire experience spelled out for me from the get-go (kudos to the meadery for so fully pinning down their brew), is a nice turn of events. During the summer before my senior year of college, I interned in New York state. Despite the bedbugs that infested the mattress I was sleeping on, it was a really great experience. In a summer full of memorable times, one of my favorite memories is sitting in the bedroom of my apartment playing Final Fantasy IX. For those of you who haven't played it, it's a silky-smooth game. I won't spoil the ending. Not because I'm nice, but because I cant. I never finished the game. I discovered I had bedbugs and high-tailed it out of there (Michelle, my fiancé, was there with me and I felt so bad for exposing her to those pests). But never mind the bugs. The important thing is that that feeling of trying to stay cool while sitting on an old, hand-me-down sofa and leveling up Zidane and the gang is one I'm not like to forget. And this, for some inexplicable reason, is exactly what comes to mind as I sit here drinking The Dude's Rug. I had never heard of B. Nektar before a week ago when I took the plunge and bought a $5 cider. But buying that bottle of The Dude's Rug was the right thing to do. It's incredibly balanced and earns a 9.5/10 from me. It put B. Nektar on my radar--I'll keep my eyes peeled for more from them! In the mean time, you try this stuff if you can find it. It's great.